​Bottom of the table Huddersfield Town host top four chasing Arsenal on Saturday with the two sides looking to bounce back from difficult defeats. Huddersfield are in desperate need for points after a 5-0 thrashing away to Chelsea and a win against Arsenal would do the Terriers the world of good as they look to stay in the Premier League. The Gunners are only three points off a Champions League spot and will see a trip to the John Smith's' Stadium as a game they need to be win if they want to get into the top four. 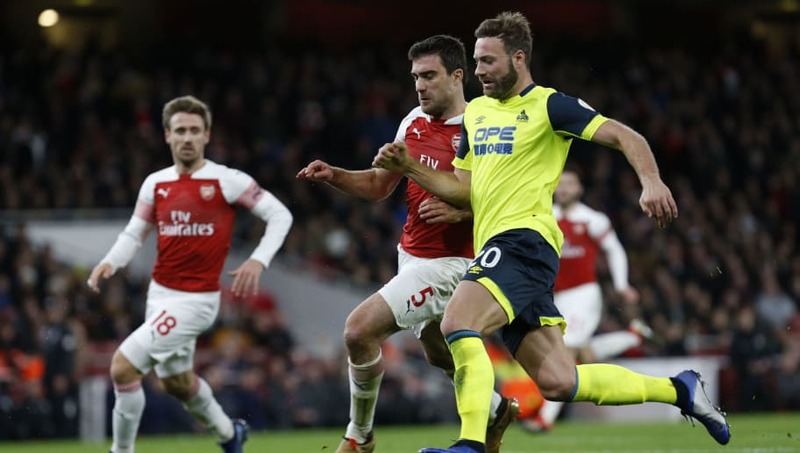 Huddersfield are looking to break a three match losing streak, meanwhile the Gunners are seeking their first away clean sheet of the season and to stop a run of six away defeats in a row. Check out 90min's preview of the ​game below. Isaac Mbenza, who was brought off injured in their last game against Chelsea, is a doubt for Huddersfield, but it's suggested that he could start on the wing. Jonathan Hogg is given a positive chance of playing after picking up an injury, but Abdelhamid Sabiri and Danny Williams are almost certain not to play. Defensively, Arsenal have a real injury crisis with Hector Bellerin and Sokratis Papastathopoulos unavailable. Shkodran Mustafi and Ainsley Maitland-Niles are also doubts but are more likely to feature in the game with so many defensive problems for the away side. Denis Suarez could be in line for his first start after the Spaniard came off the bench in their last game against Manchester City. It's more likely that Unai Emery will instead go with ​Alex Iwobi, who will look to supply Alexandre Lacazette and Pierre Emerick-Aubameyang up top. Arsenal have a boost on the injury front as ​Henrikh Mkhitaryan is set to return to the squad. The Armenian hasn't featured since December and could provide a creative spark in the side. ​Huddersfield Town ​Lossl; Hadergjonaj, Schindler, Jorgensen, Kongolo; Mooy, Bacuna, Billing; Kachunga, Mounie, Mbenza. ​Arsenal Leno; Lichtsteiner, Koscielny, Mustafi, Monreal; Iwobi, Torreira, Guendouzi, Kolasinac; Lacazette, Aubameyang. In December it took an outstanding Lucas Torreira overhead kick to break the deadlock at the Emirates. Despite being under new manager Jan Siewert, he will no doubt look back at that game and see that his team can put in a good performance against a top six side in Arsenal. The last time Huddersfield managed to beat the Gunners was back in 1971 when they sealed a 2-1 victory in the old Division One. Huddersfield have only managed to beat Arsenal 16 times in their history and have lost on 36 occasions in all competitions. Huddersfield are in desperate need of a win and haven't won in 2019 - their last victory was away to ​Wolves in November. This will be their fourth game in a row against a top eight team and even a draw against Emery's team would be a success. There hasn't been a lot to shout about at the John Smith's Stadium as Huddersfield have only won one game at home - when they beat ​Fulham in November. If they are to stay up this season it won't be down to this game, it'll be down to the results against the teams around them - in January the Yorkshire outfit only picked up one point against fellow strugglers ​Burnley and ​Cardiff. Arsenal, however, have been hit and miss. They lost last time out to ​City, but beat ​Chelsea the game before that. They need to be more consistent if they are to be a Champions League team again. Emery had a monumental challenge on his hands replacing Arsene Wenger, but a good win on Saturday would be great progress going forward. With defensive problems it wouldn't be surprising if there are some goals in this one, but ​Huddersfield need to find a consistent scorer as defender Zanka is their current leading scorer with only three goals. ​Arsenal simply have too much fire power for the Terriers and the likes of ​Aubameyang and ​Lacazette will no doubt be looking to add to their goal tallies - this should be the game which sees the Gunners get back to winning ways.